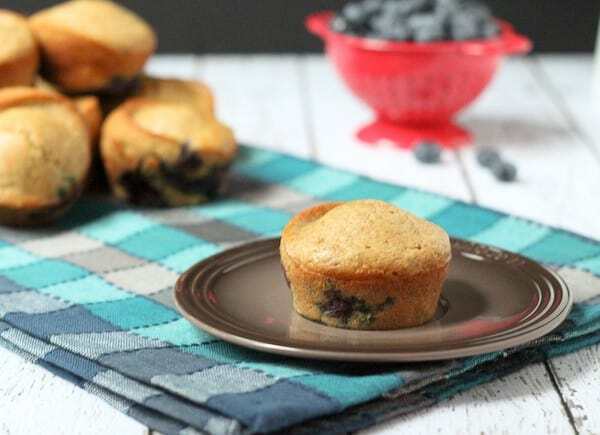 These blueberry pancake muffins have all the great taste of a blueberry pancake but with a decadent cream cheese filling — and you can eat them with your hands! Well, I’m still alive. I’ve been MIA for the last week because I’ve been busy getting our new house in order and looking nice. Takes forever to get any boxes unpacked or anything put away when you have two toddlers. It’s pretty much impossible. I’ve been lucky enough to get some semi-productive evenings in when I have a tiny bit of energy left. What has saved us is my parents. They’ve come out to help us two weekends in a row and manohman do they work hard. We’ve gotten an unbelievable amount of work done thanks to their great help. And I can finally do laundry here at our new house! THANK GOODNESS. Because, again, TWO TODDLERS. They make an awful lot of laundry dirty for being so small. Would you all be interested in some posts about our house? We’re not doing any major updates (yet), but would you want to see some photos and hear some of my grand plans? I’m sure my husband would be happy for me to tell my grand plans (remodel kitchen remodel kitchen remodel kitchen) to someone other than him. In between painting, putting away everything, and managing to keep the kids alive, I also made muffins! And photographed them during a thunderstorm! Yeah…super ideal photography weather. 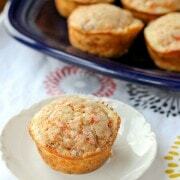 Regardless of all that, these muffins are amazing. They will definitely be added to the regular rotation here at the Gurk household. They have all the great taste of a blueberry pancake (my daughter E’s favvvvorite), but you can eat them with your hands. And even better yet, there is a little pearl of cream cheese filling waiting for you in the middle of each one. 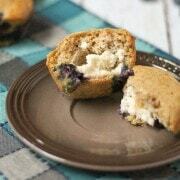 The cream cheese filling adds great flavor but also makes these a slightly more filling and hearty breakfast. I added a little whole wheat flour to make them more filling and nutritious so that you’re not hungry an hour after breakfast. I left some all-purpose flour in to give them a great fluffy-pancake feeling. Preheat oven to 400 degrees Fahrenheit. In a medium sized bowl, mix together whole wheat flour, all-purpose flour, baking powder, baking soda, sugar, and salt. Set aside. In a large mixing bowl whisk together milk, vinegar, vanilla, eggs and butter. 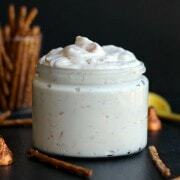 Whisk in dry ingredients until combined. Stir in blueberries. Spray 18 muffin tins with nonstick cooking spray. Fill about 1/3 to 1/2 full of the muffin batter. Using a small scoop (I used a 2 teaspoon cookie scoop), drop a small amount of the cream cheese mixture into each muffin cup. Top with a small amount of the remaining muffin batter. Bake for 15 minutes or until golden brown. Cool completely in muffin tins before removing. Store in an airtight container in the fridge. Verdict: Blueberry pancakes + cream cheese. These were obviously a winner. Husband’s take: He loved these blueberry pancake muffins too which was surprising considering he’s not a huge cream cheese fan. N’s take: He loved these too. And he’s incredibly picky. E’s take: She loved them one day and the second day she said “I don’t like cream cheese.” Kids. What are you gonna do. Craving more blueberries? Check out this smoothie, this frozen yogurt, this chicken or these muffins. 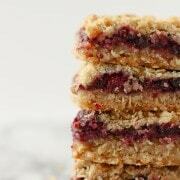 I love everything about these, but especially the cream cheese filling! i’ve never tried pancake muffins but they look so fun! love that filling too. yum! Yum! 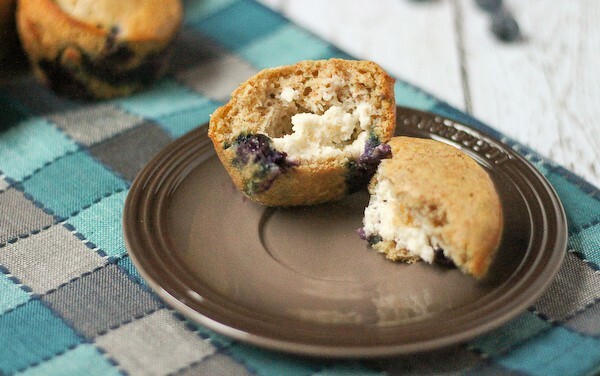 A cream cheese filling hidden inside a blueberry pancake muffin sounds mighty good to me! I was laughing at “E’s take” on these muffins! My daughter is the exact same way. All of a sudden she doesn’t like grapes? Which she used to love? Aw how cute are these! I’ve never heard of a pancake muffin before! Yes, would love to see house posts. I like being nosey! These muffins look terrific. Good luck with everything. Glad you are alive, girl! nice surprise in the middle! OMG I feel you on moving, and I don’t even have kids. Hang in there lady. I think you are a super star! 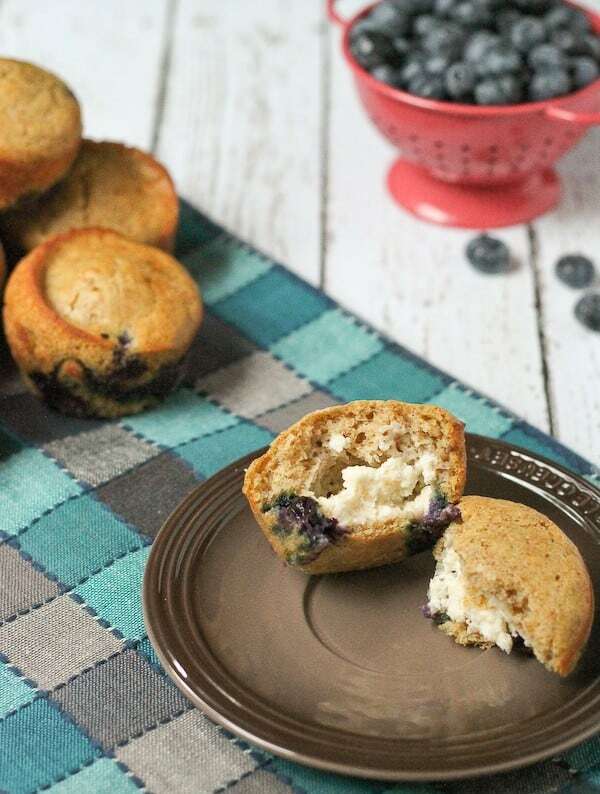 Loving these pancake muffins! Great for lunchboxes! SO happy that you’re alive girlfriend! And YES to house posts…I would lovelovelove to see! I also lovelovelove these muffins. I have a serious addiction to blueberry pancakes…so portable ones? I die. Pinned !